THE death of the long bull market in bonds has been called many times in recent years. Such a consummation is devoutly wished for by those who think the global economy will never get back to health until short- and long-term interest rates return to more normal levels. The rationale for the shift is the belief that Mr Trump will push through a fiscal stimulus, in the form of tax cuts and infrastructure spending. Not only will that boost the American economy but it will allow the Federal Reserve to return monetary policy to more “normal” levels by pushing up rates from the current 0.5%. It could also lead to higher inflation in the medium term. Forecasts for American inflation in the early 2020s can be derived from the bond market. In July, they pointed to 1.4%; now they imply 2.1%. All three factors—faster growth, rising short-term rates and higher inflation—are usually drivers of higher bond yields. In the course of 2016, moreover, fears of deflation and a sharp slowdown in the Chinese economy have steadily faded. As a result, it seems less and less likely that investors would want to own government bonds, especially as trillions of dollars-worth have been offering negative yields. Nevertheless, this bond-market sell-off needs to be set in context. During the “taper tantrum” of 2013, when the Fed signalled a slowing of its quantitative-easing programme, the ten-year yield reached 3%. It was as high as 2.47% in June last year. Moreover, other bond markets have not been as seriously affected by Mr Trump’s election (see chart). In Germany, ten-year yields may no longer be negative but they are still just 0.2%. Indeed, the gap between German and American ten-year yields is at its widest since the 1980s. British yields are around where they were at the time of the Brexit vote but well below their level in January. In Japan the yield on the ten-year bond is still close to the central bank’s target of zero. Continued bond purchases by central banks are one reason why yields may not rise that far in Europe and Japan. What is more, pension funds and insurance companies will continue to be ready bond buyers—at almost any yield level—as they seek to meet regulatory requirements or to match their long-term liabilities. Furthermore, it is not clear how much of Mr Trump’s programme will be implemented, nor indeed whether economic growth or inflation will actually rebound. “The factors affecting inflation are long-term: globalisation, deregulation and automation,” says David Lloyd of M&G, a fund-management group. In addition, a rise in bond yields may play a part in choking off economic growth. The ratio of total debt (governments and private sector combined) to GDP has risen in both developed and developing economies since the 2008 crisis. “A large stock of debt needs a low interest rate to make it tolerable,” says Mike Amey of PIMCO, a fund-management group. The rise of extremist politicians brings with it the risk of extreme outcomes. The problem for investors is that the implications of such shocks are not uniform. 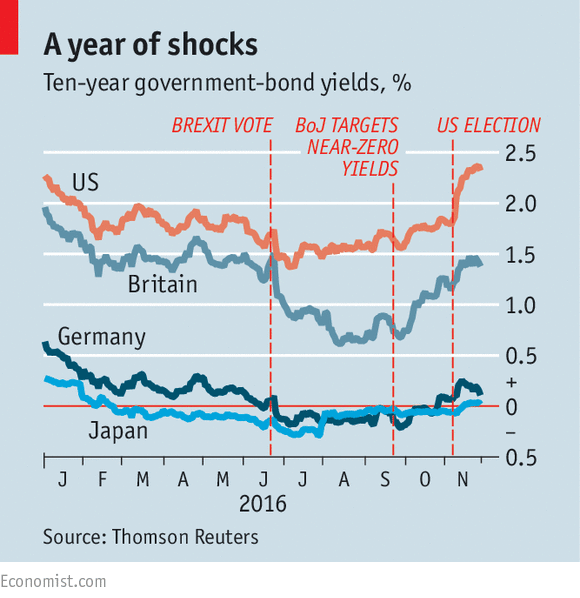 The Brexit vote was followed by a fall in bond yields (as cautious investors opted for the safety of bonds), but the election of Mr Trump caused yields to rise. Had the president-elect made a swift promise to pursue his protectionist agenda, however, bond yields might have fallen, since a tariff war would hurt economic growth. The election of Marine Le Pen as French president would probably cause European government bonds to sell off; yields in America and Japan might fall. The biggest problem for investors is that ultra-low yields leave so little margin for error—the likely annual return on most long-dated bonds can be wiped out in an afternoon’s trading. Government bonds may still find ready buyers, but they won’t sleep as soundly as they used to.